I often get stuck in a loop. Having a good organized list can help, but not always. Sometimes my inbox has 431 unread messages. I struggle with how to return a phone call, never sure how much access I'm going to have to speech. I start a project with enthusiasm and get derailed when the next big thing comes along, demanding 100% attention. Deadlines are my best friend and archenemy. I sometimes need help with staying on task and I resent that I need help and I resent the people who help me. It's all part of the package. Challenge 20 is for me. You can share it if you want to. It's not an easy one. I need to find better ways of balancing acceptance of my autistic style of tasking with actually delivering work while it is still useful. Taking on fewer tasks is not always an option. I'll be checking in here (eventually) to let you know what happens. I did pretty well with this, coming through with 90% of the promised challenges by the deadline. I'm counting this as a win. 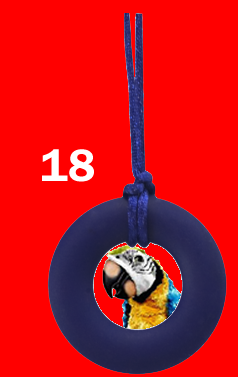 Speaking of winning, the winner of the Squawkers McCaw Autism Acceptance Challenge is Jennifer Vail, who completed 15 of the 18 actual challenges (#19 was not a challenge, and #20 is a day late.) 30 people participated in the official challenge, and many others took part without ever posting a comment. I noticed those people who signed petitions and liked pages without entering the competition. I appreciated these responses every bit as much as those who made themselves known here. Jennifer Vail, please send me your mailing address. 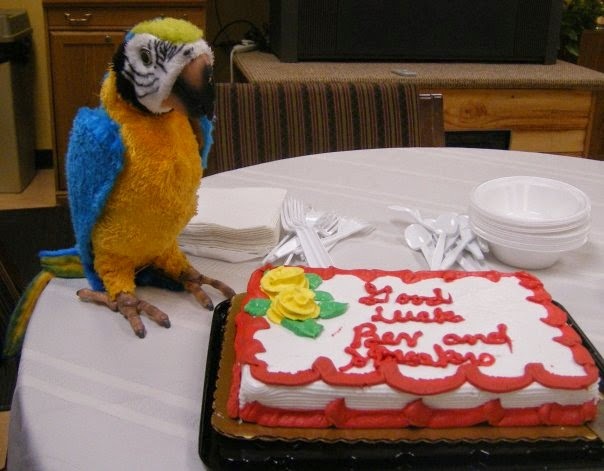 Your parrot will be released on Monday. is soon to be released to a new home. This can’t happen. Not today. Not yesterday. I made a commitment to write 20 challenge posts this month and there is only one more day. Maybe tomorrow. Should I ask you to watch Wretches and Jabberers or Citizen Autistic? Participate in scripts? Respect boundaries? Yes. I should. None of this is trivial. But today, they are not the most important things. Supporting acceptance of autism and autistic people matters and will always matter to me. The truth is that our lives depend on it. On another day, I will talk about what that means. Today I have to look beyond autism, beyond myself, beyond the people I know best. Other people are hurting more. Other lives are in danger, immediately and always. I don’t have a lot to say about it, except to other white people. Some of you won't like it. I don't like what I've been hearing from some of you either. Stop saying “thug.” Stop saying “like animals.” Stop saying “but they are destroying their own neighborhoods.” Stop saying “violence is not the answer.” Stop hijacking hashtags to include yourselves. Everyone already agrees that your white life matters. Stop it. Stop acting like you know something. Stop saying anything and start listening to and boosting the messages of Black people. Think about why this should matter to anyone who cares about justice for autistics/disabled people/people with disabilities. Think about how empty and meaningless our advocacy is if it doesn't. Talk about that. But first, listen. Listen more. Support and boost. If you came here looking for a challenge, let this be that. But don't think this is part of some contest or game. Freddie Gray deserves better than that. Being autistic in April is not usually a happy experience. Every year, we are surrounded by reminders that we are not welcome on the planet. The lit up blue buildings and puzzled lapel pins and endless parading of “tragic” statistics and “devastating” costs contribute to an already toxic and willful misunderstanding of what autism is, denying our very right to exist. There have been Aprils when leaving the house was nearly impossible. What could I say that would not be met with scorn or derision? I have felt truly alone in the world. This year has been better (for me, anyway.) Autistic people have made it better. 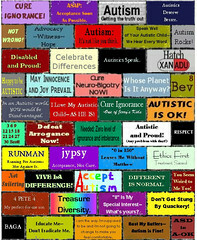 From #WalkInRed to ASAN’s #AcceptanceIs campaign to the A-Z postings of Unstrange Mind and the Autism Acceptance Month events hosted by Autism Women’s Network, Ed Wiley Autism Acceptance Lending Library and many others, autistic people have worked together and separately to take back April. Today I want to highlight a month long promotion that has been going on at Stimtastic. Stimtastic is an autistic owned company that makes fidget toys, chewable necklaces, spinnable rings and other cool stuff. Throughout the month, Stimtastic has been giving away items via social media outlets including Tumblr, Twitter, and Facebook. Today’s challenge is to “like” Stimtastic on Facebook and comment on the post there offering a free item to a randomly chosen commenter. That’s it! Let me know that you did this, what item you requested and why. It can be something you want yourself or a gift for an autistic person in your life. 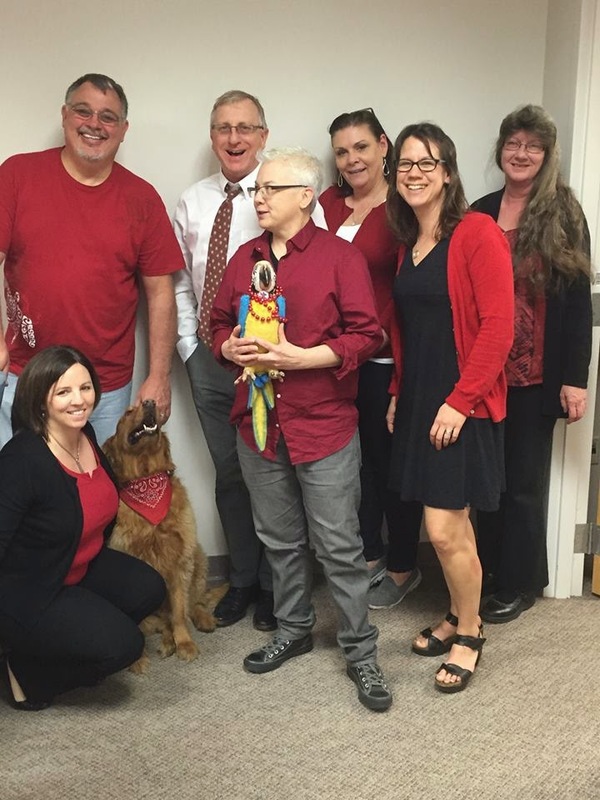 On April 2, everyone in my office was wearing red. Share your one sentence stories of autism acceptance in the comments to complete this challenge. Not long ago, I sat in a meeting composed of parents and professionals. The group was interested in learning more about what supports autistic people need. How would they find out? You can probably guess what their solution was: Let’s survey all the parents! Not one person suggested talking to autistic people themselves. I wasn’t having a good speech day and it didn't get any better from there. I wish I could say that I quickly and diplomatically pointed out the error in their groupthink. Some days I can. Some days I just…can’t. It left me feeling all powerless and Twilight Zoned. My identity as an advocate/activist was a joke. There was no point to my presence in the meeting and I was never going again. And then it was another day. I remembered that being autistic sometimes means not being able to get words out and I made a plan to communicate with the group in a way that would work for me. 1. What would you most like people to know about autism? 2. What supports do you need to do the things you want to do? IMPORTANT: The person you ask is under no obligation to answer you. Do not go out there demanding responses and tell them I sent you. The point of this to get used to seeing people as the experts on their own lives. Any time or information the autistic person gives to you is a gift. You have no idea what it may be costing them. If you are autistic, complete this challenge by answering the questions in the comments here. But only if you want to and have the spoons to do it. 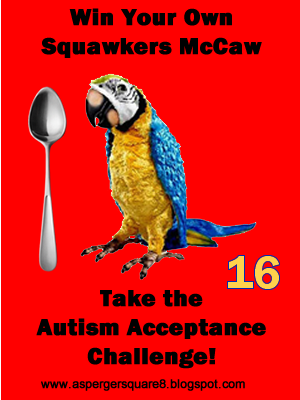 Autism Acceptance Challenge 15: What's Your Squawkers McCaw? Why do you have that bird? Lots of reasons! See below. What's your Squawkers McCaw? What is uniquely yours that helps you get through the day? Is your chosen support seen as acceptable? Age appropriate? Weird? Controversial? Do you even know that you have it? Today’s Challenge is to interact with puzzle pieces in the wild. This goes for other offensive images and rhetoric too. 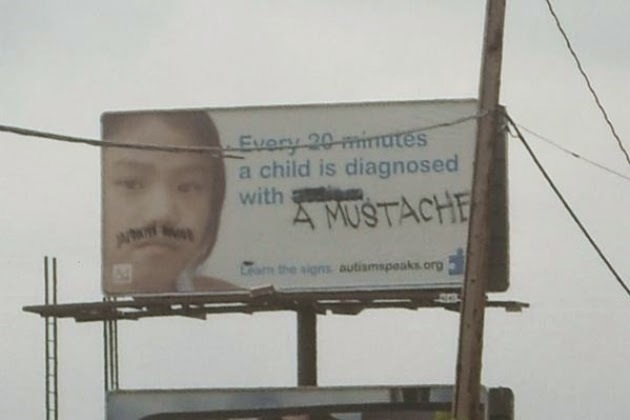 Here’s an example where a graffiti artist decided not to let Autism $peaks have the last word. Photoshop? Maybe. But there are plenty of more accessible targets around, especially during April. You can NeuroQueer any reachable flyer or poster by adding your own text or art. 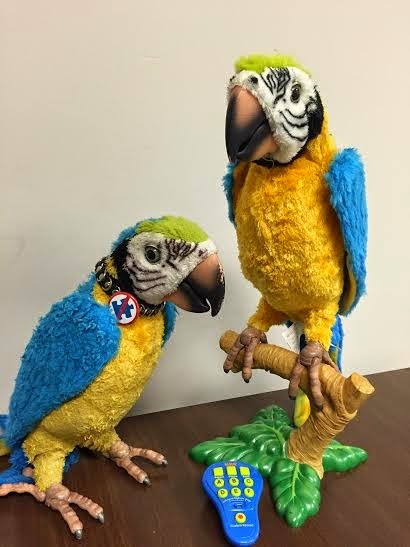 Here’s Squawkers covering up a puzzle piece ribbon for the Unpuzzled blog. Squawkers should have added a link to an informational website. And this is a more recent conversation entered using a Post-It. 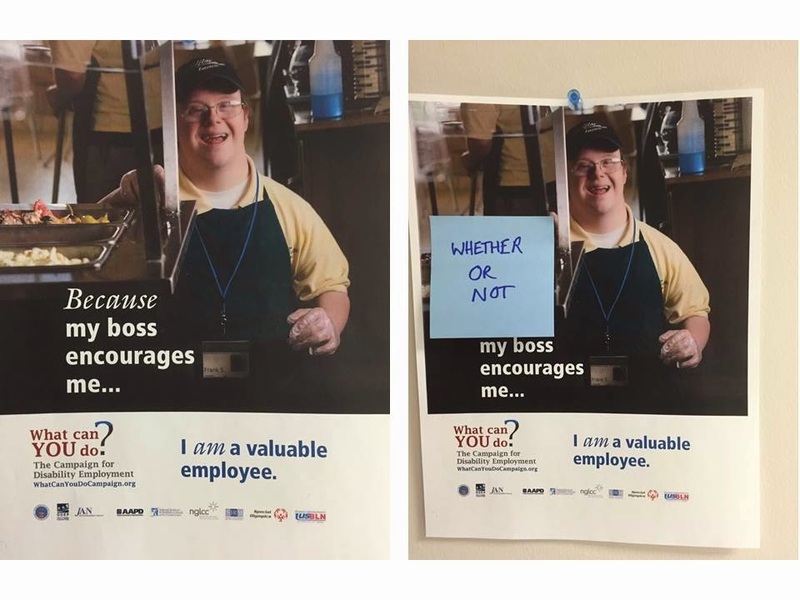 Before picture shows a person with Down syndrome and the caption: Because my boss encourages me...I am a valuable employee. After picture says: Whether or not my boss encourages me...I am a valuable employee. There are many ways to do this. A transparent “no” symbol on a sticker can quickly flip the meaning of any image. I have also been known to place informational flyers like this next to A$ advertising. Nothing is destroyed or defaced and no one is harmed using these methods. I’m not saying I've never used a permanent marker. Not saying I have. But for those of you taking the challenge, that’s not what I’m suggesting. Let me know in the comments if you have used any of these ways of interacting with symbols and rhetoric. What other methods have you used? Note: I am using the word NeuroQueer in this context to mean subvert. I am using it as a corollary to “queer” as a verb. For more on the basic or actual meaning of NeuroQueer, here is some reading.